I have a week ahead where I am not in college and just in work so I hope to do a good few blog posts this week. The posts will all be mainly music ones including reviews of some of the concerts that I went to in 2008. Strike Curious Poses will still have it's heart stuck primarily in the 1980's but as there is only one more year left in this decade and we head in the 2010's it's seems like just as this decade in music was very much influenced by the '80's the next decade will be a time of 1990's nostalgia and reinvention. I loved a lot of pop in the 1990's but very little indie or Brit Pop. The 1990's were for me about the various boy/girl/boy & girl bands and whatever Madonna, Kylie, Janet and whoever continued on from the 1980's were doing. The 1990's for me were also about the type of dance music that that decade produced. 1990's dance music was both a continuation of '80's house, pop and the early days of techno and also a sound of it's own time. As other music sites, that I love, continue to centre on mainly the music in today's charts or future charts my pop brain is happily in the past so I think that's what this site will be concentrating on from now on. There's so much music, specific songs more so than the entirety of an artist's work that I love, so there will always be something to write about. As ever I love all the comments I get on my posts so thank you readers new and old. For me 1990's dance is remembering going out on the Dublin gay scene. Most of the songs I liked I usually heard them in some pub or club a long time before they were in the charts. Some songs never charted at all but lots did as MTV used to still show music videos in those days and especially on Dublin pirate radio stations there were some great dance shows. I'm almost certain that there was a station called Phantom which just played dance songs. There is a new Dublin based radio station called Phantom but I really hate the way that it's philosophy is that the only music that matters is indie. Most club tracks were best heard in their extended remix versions. 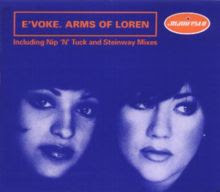 One great song was "Arms of Loren" by E'Voke. That song got to number 25 in the UK charts in August 1995. E'Voke was comprised of two female vocalists, Marlaine Gordon and Kerry Potter, as pictured above. They also starred in a BBC sitcom called "Us Girls". There are two main mixes of "Arms Of Loren". One is the Steinway mix, the other is the Nip 'N' Tuck version which is featured below. Around the 3:56 mark there is a great "Hey! What?!!" which is similar to the beginning of Madonna's "True Blue". Both vocalists in E'Voke went on to do other acting and music work. "Arms Of Loren" is a song that still sounds strong and vibrant today.